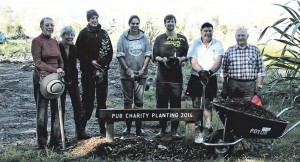 With the planting season on us, the Friends of the Otaki River held their first public planting day, the Pub Charity Family Planting, above Chrystalls Bend recently. About 30 people turned out and made short work of imbedding the 1000 trees, shrubs and grasses in the prepared holes. Among the new plants were five northern rata, from of the 50 seedlings donated to the Friends from Project Crimson Wellington, which specialises in raising seedling northern and southern rata and some varieties of pohutakawa, which are distributed to environmental groups. They worked speedily in the autumnal morning and had all the plants in by 11.30. The Friends will be planting this year’s rata among their various planting areas. They received 35 northern rata in 2013. 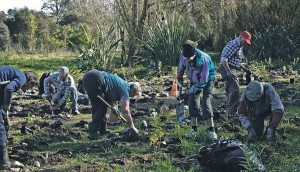 In this new area, just east of Chrystalls bend, the banks of the Waimanu Stream had already been planted with carex grass by KPMG Accountants staff members on a previous business team-building exercise. More recently they have been back with Warren Baillie from Endangered Crafts, and learnt the art of building gabian basket seats, “legs constructed from riverstone-filled wire plinths topped by rough sawn timber; four were built and installed along the river walkway. The area to be known as the Pub Charity section, acknowledges the $19,000 the Friends have received from Pub Charity through their sponsorship of the print and reprint of Rex Kerr’s book Otaki River Ko Otaki te Awa. All proceeds from the sale of the book have gone back into the restoration planting along the river. “We very much appreciate the assistance we get from Pub Charity,” FOTOR secretary, Trevor Wylie said. 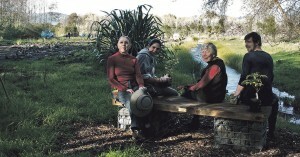 Among the workers were three visiting wwoofers, young people on the overseas adventure. Woofers’ – World Wide Opportunities on Organic Farms, mostly young people travelling around the world, stay on organic farms, working four to five hours a day in return for free food and accommodation. The three were staying at Ron Eckman’s farm on Swamp Road. Paulina Morice from Poland, Gill Ronald from Scotland and American Joey Hall, were all enjoying their time planting with the Friend’s group and the Wwoofing experiences. Greater Wellington Regional Council’s environmental planner, Anna Carter, was there to lend a hand, too. GW will be installing a new footbridge over the Waimanu Stream at the Pub Charity section within the next few weeks. In another first for the day, were the three new wheelbarrows, donated to the group by the RD1 store in Levin. These will be a great help during their work, carting mulch to the newly planted trees and shrubs, and around the nursery. 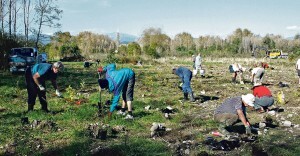 The next planting day will be on Arbor Day, when they will be working with pupils from Otaki School, who have spent the last year raising seedlings which they will plant out at the estuary. The Honda Tree Fund planting day will be on Sunday June 29 from 10am, planting along the river walkway to Chrystalls Bend.